UPVC is a popular material for today's windows. UPVC windows and doors do not require much regular maintenance, painting or weatherproofing and will provide you with many years of trouble free service. But some problems can develop over time. Handles are sticking, windows or doors do not close properly or are locked shut, rubber seals become loose or crumble, letter plates have fallen off. The list can be long, but most problems can be repaired or replaced cost effectively. 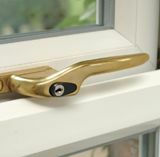 Over the years millions of people had windows, doors and conservatories fitted by countless local and national companies. 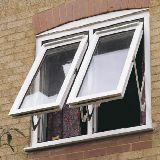 Each company has used different window systems with different mechanisms to manufacture their product. Many parts are not standardised and have been supplied by different manufacturers, while some companies have produced their own parts. And designs have changed over time to improve looks or security. This can all be very complicated and confusing, and your installer may not have included a warranty, or the guarantee has expired, or the company has even gone out of business. But we are here to help. We specialize in repairs, and will not try to sell you a new window or door. We will inspect any window or door problems, no matter who manufactured or installed the product, regardless of age, size or location, all problems will be reviewed and we will give you a free quote for the job. We can rectify many problems on our first visit, and we have many parts in stock. However, if we do not have replacement parts, we will take the exact measurements and try to identify the correct part or a suitable alternative from our suppliers. We will then provide you with a quote, so you can decide whether you want us to order the part. We are fully trained, experienced and insured to complete all of our services - at affordable and competitive rates. No job is too small, and all work is carried out with the same care and attention. With our repairs you can get many more years out of your window, door or conservatory. And why not ask us about refurbishment or upgrades to improve your windows and doors? All window and door repairs apply to conservatories as well. In addition we also fix leaks in conservatory roofs, repair or replace gutters, or replace polycarbonate roof sheets.